Rumours of whether or not the Galaxy S9 would include a headphone jack have been conflicting for months. 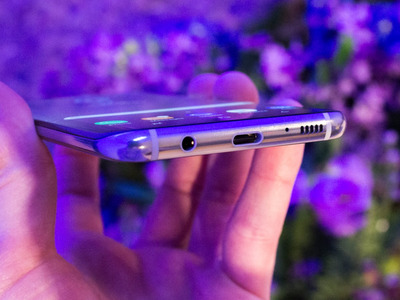 Rumours have flip-flopped as to whether the Samsung Galaxy S9 would include a 3.5mm headphone jack, but a recent leak suggests that the 2018 flagship may retain the feature. Tech informants on Slashleaks shared an image of what they claim are circuit boards for the Galaxy S9, which reveal 3.5mm headphone jack and USB-C placements. The components include the model number, SM-G965F, which is associated with the Galaxy S9+. If true, it is likely both rumoured models of the Galaxy S9 would include headphone jacks. Rumours about whether or not the Galaxy S9 would include a headphone jack have been conflicting for months, but there have been several indications leaning toward a headphone jack. While an October rumour claimed the Galaxy S9 would not include a headphone jack, another tech informant on Twitter known as @UniverseIce suggested the feature would stay. Additionally, there been several leaks of protective cases for the Galaxy S9 that show cut-outs for the headphone jack. It is possible that we’re hearing conflicting rumours due to Samsung testing different prototypes of the Galaxy S9 with and without a headphone jack. At this time, however, all of these claims are just rumours until Samsung officially announces the phones early next year. The Galaxy S9 may be announced in late February, during Mobile World Congress (MWC). The Galaxy S8 was unveiled in late March 2017, but a late-February announcement would actually more in step with Samsung’s usual launch cycle for its Galaxy S devices. Several leaks have indicated that the Galaxy S9 likely won’t feature an in-display fingerprint scanner, but Samsung may move the rear fingerprint scanner to a more accessible area: on the center of the phone’s back, below the camera module, rather than to the right of the of the camera. Rumours also suggest Samsung may include a dual-lens rear camera configuration on only the Galaxy S9+ model, while the standard Galaxy S9 may have a single-lens camera. Leaks have suggested the overall Galaxy S9 design will likely be very similar to the Galaxy S8, with an “Infinity Display” and no home button. Bezels on the Galaxy S9 may be slightly smaller than on its predecessors, providing slightly more screen real estate.